Cambridge, Mass. 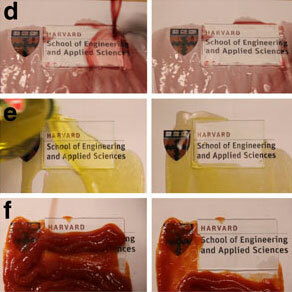 - August 2, 2013 - A new transparent, bioinspired coating makes ordinary glass tough, self-cleaning and incredibly slippery, a team from Harvard University reported online July 31 in Nature Communications. SLIPS was inspired by the slick strategy of the carnivorous pitcher plant, which lures insects onto the ultraslippery surface of its leaves, where they slide to their doom. SLIPS' thin layer of liquid lubricant allows liquids to flow easily over the surface, much as a thin layer of water on an ice rink helps an ice skater glide. (See video.) Unlike earlier water-repelling materials, SLIPS repels oil and sticky liquids like honey, and it resists ice formation and bacterial biofilms as well. "The SLIPS-like coating is mechanically stable and has a long-lasting performance as a slippery surface because it’s composed of a sturdy honeycomb-like structure that holds lubricant in tiny, container-like pits," said lead author Nicolas Vogel, a postdoctoral fellow in applied physics at SEAS. Updated August 15, 2013. Adapted from a release by Dan Ferber, Wyss Institute. High-resolution images and video are available upon request.